Tuvimos una grata experiencia. Nos recogieron en el hotel media hora antes de la cena programada con un chofer particular. Cuando llegamos al restarán nos atendieron muy bien. La comida era a la carta, con opciones de entrada, plato de fondo y postre, más vino. Al términos nos llevaron al local del frente y nos ubicaron en primera fila. El espectáculo de primer nivel, con bar ilimitado. Al finalizar otro chofer nos esperaba a la salida para regresarnos al hotel. 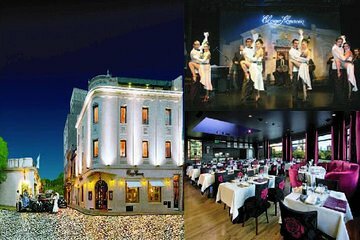 Lo recomiendo absolutamente, ya que de todos los espectáculos de tango que hemos ido en Buenos Aires, con cena, éste es más exclusivo, porque no se comparten las mesas con otros comensales que no conoces. La cena es muy buena. The tango show was really good and we enjoyed it but the dinner wasn't worth it. wow ! the show was amazing, I did the VIP option and food and wine were great! An absolute Must! The best show in town. The dancers are outstanding and the musicians too. The piano player was extraordinary! The dinner, I went for the traditional menu, was not that great. The steak was very good,but the rest mediocre.Service was good and friendly. I also liked the Malbec. The tango show was outstanding would recommend it to anyone. Very enjoyable evening. The dancers were incredible. Disappointing. The tango is such a beautiful art form. Its enthralling, in and of itself. But, these people put on a glittery Las Vegas-style Review. Such a shame people come all this way to Buenos Aires, and are left with this impression - Also, they need to be clear about the time. It states, Tour Details. Time: Dinner and Show: 7:00 Show Only 8:30. So, I arrive at the venue at 6:45 for dinner. The owner/operator says no, its at 8:00. I had dinner elsewhere, and game back for the show which is in fact at 10:00.